Nick Fisher is State’s most eligible bachelor—confident, creative, and driven—and is completely aware that every girl he knows is trying to land him. But Nick is more than the marketing genius everyone sees on the outside. In fact, his life is far more complicated than anyone suspects . . . even his own brothers. Jess Michaelson knows she shouldn’t want Nick like all the other girls do, but she’s crazy about him anyway. How could anyone resist those charms? When he focuses his attention on her, she has no idea what she’s truly in for. But it’s worth the fight. 99c but will be going up anytime now!! J Sterling is one of my “I must read authors,” she never fails to deliver an angsty, swoon worthy story and always nails that character connection. 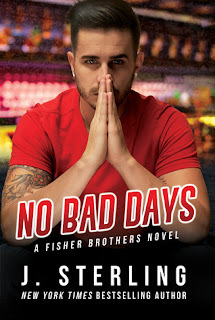 While No Bad Days is not as angsty as her norm, there were a few tears shed from this over emotional reader, so once again, J Sterling got me again and even though I am over forty, I still love my college romances and this one ticks all those boxes. This was a book I picked up and didn’t put down till I had finished. Nick Fisher is the guy that all the other guys want to be and all the girls want to be with. He is the President of his fraternity, is extremely popular with both sexes, of course, drop dead gorgeous but unlike most frat boys is picky with his hook-ups and relationships. While on the outside he is an egotistical rich kid he only lets people see what he wants them to see. Nick keeps his cards close to his chest, especially when it comes to family and his life in general. Jess Michaelson is your average student, she doesn’t come from wealth, she doesn’t draw attention to herself, she is clever, motivated and knows what she wants from college life. She is not oblivious to Nick Fisher, the whole college lets you know when he is in the vicinity, but he was someone she had watched from afar, knowing that there wasn’t a chance he would notice her…until he did. Frat Nick and Jess Nick were two totally different people and I loved the fact that Nick held the real him back for the people that mattered. While it takes a little time for these two to really connect, that getting to know you faze was adorable with a capital A. The openness between them, the sharing of vulnerabilities and the not so savoury parts of their lives went a long way to show from the start how in tune with each other they were. The chemistry was apparent in spades and as always with a J Sterling read, intense character connection. As with any college romance there are highs and lows, jealousy and gossip is rife, but when these two were together, they were all that mattered, they were all the other one saw. They have mountains to climb, they have their problems to overcome but are they insurmountable? I cannot wait for the rest of the Fisher boys; Nick’s brothers are introduced in this book and with them being a fair bit older than Nick their stories are going to be “adult.” What the hell could two handsome, bar owners get up to? A lot!! Cannot wait, bring it on Jen.